Low prices. OrangeSmile.com offers car hire service in Barbados on the lowest-rate-guarantee basis, since we work with car suppliers directly. For your search criteria in Barbados, we always select and show the best rental offers. The car reservation process consists of 3 simple steps: (1) search for available cars for your dates in Barbados; (2) select your car type; and (3) fill in the booking forms. Once the reservation is completed, you will receive a confirmation voucher to your email address. During the booking process, please check your rental conditions. To pick up your car at the rental point in Barbados, you need to provide our confirmation voucher, your driving license and a valid credit card. The final payment is normally carried out at the pick-up point. Our car hire points in Barbados accept VISA, MasterCard, etc - please check your rental conditions. At the pick-up point, please read the handling manual and check the car for present defects. 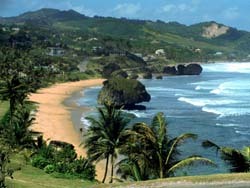 OrangeSmile.com wishes you a pleasant journey to Barbados! The car hire reservation system OrangeSmile.com allows renting a vehicle in Barbados within 10 minutes. Our largest database of car suppliers enables us to provide you a rental car in Barbados at the cheapest rate ever possible. At rental locations in Barbados we offer the following car sizes: mini, compact, economy, standard, premium and luxury. The following car types are available in Barbados: Sedan, Hatchback, Jeep, Cabriolet, Coupe, Minivan and Minibus. The majority of historical landmarks are located in the capital of the country, the city of Bridgetown. Here travelers will find beautiful St. Mary’s Church. The church appeared on that spot yet in 1630, however, it was destroyed and a new church was constructed on its site in 1827. This is the church that visitors can see nowadays. Barbados Museum is the best place to learn much interesting about the history of the island. Exhibitions of the museum are dedicated to the indigenous people of Barbados, the period of slavery and the proclamation of independence from the United Kingdom. There is one more landmark not far away from Trafalgar Square – the Parliament. The old building is a good example of the neo-gothic style. You can save on GPS-navigator if you pre-download all the necessary maps to your smartphone and use them during your trip in Barbados.